White paper on crime 2004 Part1/Chapter2/Section5/1. 1. 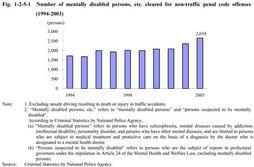 Trends in offenses committed by mentally disabled persons,etc. Fig. 1-2-5-1 shows the number of mentally disabled persons and persons suspected to be mentally disabled(hereinafter collectively referred to as"mentally disabled persons,etc. ")cleared for non-traffic penal code offenses(excluding unsafe driving resulting in death or injury in traffic accidents;hereinafter the same in this section)over the last10years,from1994to2003.Among the379,602persons cleared in2003,999were found to be mentally disabled and1,655were suspected to be mentally disabled.Mentally disabled persons,etc.accounted for0.7%of the total. Fig. 1-2-5-2 shows the number of mentally disabled persons,etc.cleared for non-traffic penal code offenses in2003by type of offense.Those who committed theft,fraud,and embezzlement(including misappropriation of lost property)accounted for the largest share,53.0%of the total2,654cleared.The proportion of mentally disabled persons,etc.in the total persons cleared was high for arson(14.3%)and homicide(8.4%).